Exposed dentine – this can be on the biting surface or on the neck of the tooth. On the biting surfaces of the premolar and molars and canines this occurs on the cusps (essentially mountain peaks). When these peaks are worn through, a round crater forms. On the biting surfaces of the incisors this occurs on the incisal edge and leaves a rectangular crater. To prevent further wearing of the softer dentine, a filling is placed. Once the internal surface of the enamel is exposed, it becomes brittle as the dentine allows the enamel to bend. The further the dentine wears, the greater the chance of the enamel splintering or even cracking off. This can also cause sensitivity, a food trap and the increased likelihood of decay. 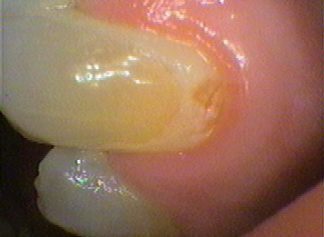 In severe situations the dentine itself cracks. THIS IS NOT GOOD. The superstructure is now compromised and large amounts of tooth may fracture, and the tooth may even split and be lost. 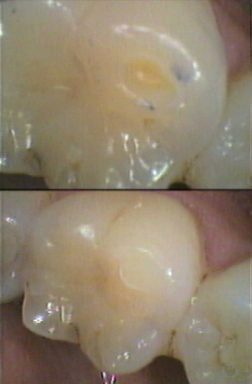 In this situation a filling needs to cover the cracked area and be designed to prevent the crack opening and closing. This is called cusp capping. Ultimately a crown may be needed to cover the entire tooth. On the neck of the tooth, the soft enamel can be worn away by over brushing or lost due to decay due to poor cleaning. Again a filling may need to be placed. If it’s shallow then a desensitising agent may be used to stop sensitivity and the tooth brushing technique corrected! It’s a major problem as it affects the person’s teeth for LIFE! Next week we will discuss the other effects in jaw joint issues and loss of tooth structure height.